DISPLAY YOUR BOOKS IN STYLE WITH THESE MODERN BOOKENDS. This distinctive bookrack from Office Square is the stylish way to organize your reading materials. 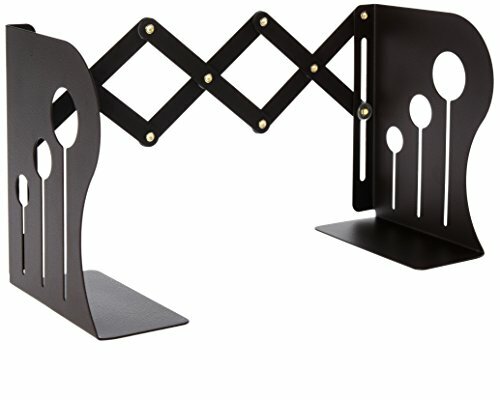 Constructed from heavy duty steel with charming cut-outs on either end, the bookends have a durable, long-lasting powder-coated finish that is both scratch and chip resistant. The stable base makes the unit far more secure than traditional two-piece bookends. The accordion design at the back of the bookrack makes it fully adjustable. Have a lot of books Extend the bookends to their full 14.76-inch width. Only need to store a few books Retract the bookrack to as small as 6.8 inches across. The clever design of the bookends keeps everything secure and it's solid enough to hold oversized and heavy books without anything falling over. Available in neutral black, these metal bookends fit with any color scheme, and the attractive design will add style to any room. Use it in the kitchen to hold cookbooks. Place one in your home office to hold manuals, binders, and files. Put one in your child's room to hold picture books, coloring books, or school books. Store magazines and novels by your favorite chair in the den or bedroom. Office Square Adjustable Metal Bookends are a welcome gift for anyone who loves to read. Buy one for yourself and one for a friend today!